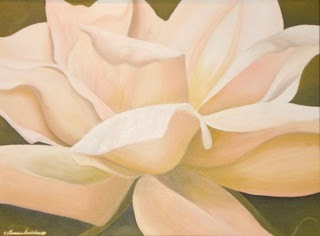 For the month of April at Weicherts, 231 E. Main, the featured artist is Tamara Davidson. You can see her artwork at the opening reception held on First Tuesday, April 2 at 6:00 p.m. until 8:00 p.m. while enjoying hor d’ouervres and free wine as well as musical entertainment by the Half-Grass’d String Band. The artist, Tamara Davidson enjoys working in colored pencil, watercolor and acrylics and she especially likes the versatility and textural qualities of the acrylic medium. She is inspired by the art found in nature and in life; her favorite subjects are flowers, the ocean, and animals. 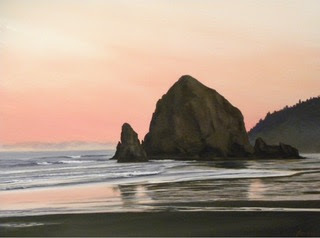 Some of the places her paintings have been shown include Fairweather’s House and Garden in Seaside and Fruffels in Cannon Beach, Oregon. Her work is owned by collectors residing throughout the United States and Canada. Davidson hopes her paintings will transport the viewer to a peaceful and happy place just as the creative process does in herself. Entertaining for the reception will be the music of the Half-Grass’d String Band who play Bluegrass music, Old-School Country music as well as Folk and the Blues. Their motto is “Ancient Tunes for a Modern World. They will fill the large space at Weicherts with a joyful noise so be sure to come ready to enjoy both the music and the art. Anya Dollis April’s featured artist at Clark’s Bistro and Pub, 264 E. Main St. with an opening reception on First Tuesday, April 2 from 6 p.m. – 8 p.m. Musical entertainment for the reception will be singer/guitarist Sean Paul. Artist Anya Doll has chosen to explore similarities in apparent opposites challenging and inspiring her both externally and internally. Facing tensions in the human condition by lovingly creating out of the pain of living became her passion. Challenged by her husband’s mental illness which led to his suicide in 2015, she changed from acrylic painting to “painting with thread” or freestyle machine stitching of collaged fibers. This unique art has evolved into creating prayer flags that informed her painting, just as painting informed the fiber work. You won’t want to miss this opening reception where you can talk to the artist while viewing her artwork. Besides that you will be hosted by Judith Shortt from Phoenix Realty with free samples from Clark’s menu and, as always, free wine and musical entertainment this time from the busker Sean Paul. He may look familiar to you since you might see him playing his songs on a street you are passing by. Making that a way to share his music, Sean plays whenever and where ever he is just for the fun of it.